Russia’s writers have always been on the move, and journeys have always been a part of a Russian writer’s personal and literary biography. We have selected four trips from different periods of Russian literary history that represent the Russian writer in motion. Some are fictional and others were real, some were journeys into exile, while others represented periods of wandering. Yet others were personal quests, some successful and others tragic, and all can be retraced by the intrepid traveler. Tolstoy grew more radical in his later years, driving a wedge between him and his wife, Sonya. In late October 1910 he made a run for it in the middle of the night with winter approaching. He wrote a note to his wife, but told no one where he was going, including his doctor and friend, Dušan Makovický, who accompanied him. Tolstoy woke his coach driver and had him take them from his estate at Yasnaya Polyana to Schekino, bypassing the railway station of Zaseka, today the site of a memorial to the author. From Schekino Tolstoy took the train towards Tula and then turned back in the opposite direction. Meanwhile, all of Russia was abuzz with the news of Count Tolstoy’s disappearance. 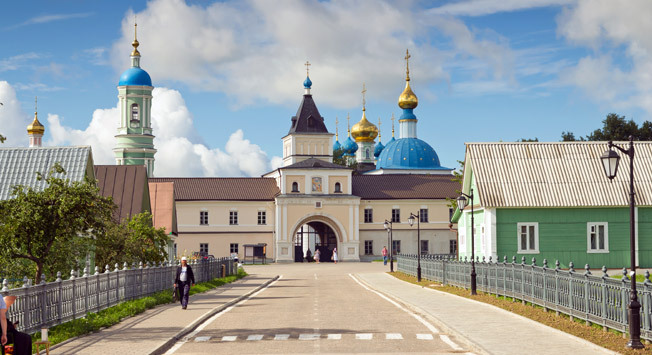 He was next sighted at Optina Monastery in Kaluga Region to the west of Tula, where he visited his sister Maria at the Shamardinskoe Convent nearby. Supposedly he inquired about renting a hut in the vicinity. But, he did not enjoy the notoriety and left in haste. At this point all that was known was that he wished to travel south, perhaps as far as the Caucasus or Bulgaria. His entourage now included his daughter Alexandra and his secretary, Varvara Feokritova. They got on a train heading southeast. Tolstoy quickly became ill and got off at Astapovo station, which today is called Lev Tolstoy in Lipetsk Region. It was here that Tolstoy died on November 7, 1910. Yerofeev spent a life in motion. Although he was born in Murmansk Region, his birth certificate lists his parents’ work site at the time as his place of birth: the Chupa railway station in Karelia, which could be why he couldn’t stay put in life. He studied in institutes in Moscow, Kolomna and Vladimir, yet never graduated and spent years roaming Russia, Ukraine, Belarus, Lithuania, Tajikistan and Uzbekistan. His prose poem “Moskva-Petushki,” written in 1969-1970 and first published in Israel in 1973 (publication in the USSR was delayed until 1989), made him famous. It details an incomparably drunken “elektrichka” or commuter rail ride from Moscow’s Kursk railway station to the small town of Petushki about an hour before reaching Vladimir. He was going to see his girl, but somehow never made it and ended up on a train back to Moscow. About 20 trains a day leave Kursk station to Petushki and the journey lasts a little more than two hours in each direction. There are two statues dedicated to this work on Borby Square in Moscow, but, in Petushki, where Yerofeev lived for about two years, there is but a room dedicated to the author at the city art gallery at Ul. Kirova 2a. Chekhov set the gold standard for voluntary literary excursions for Russian authors. He kept his trip to Sakhalin Island a secret from his family until he was ready to leave. His journey to Sakhalin through Siberia took 82 days and was described in the collection “From Siberia.” After spending several months among exiles and prisoners on Sakhalin, Chekhov had gathered enough material and headed back, first stopping in Vladivostok, before sailing south, visiting Hong Kong, Singapore, Ceylon, and passing through the Suez Canal. He arrived in Tula at the end of 1890. He wrote his book “Sakhalin Island” for the next five years and it was published in 1895. Chekhov is memorialized in several locations from his journey. The main theater in Yuzhno Sakhalinsk is named for him and statues stand in the cities of Krasnoyarsk and Tomsk. The latter is a statue of revenge. Local lore has it that Chekhov thought that the women of Tomsk were ugly and the men drunks, thus the statue on the embankment shows Chekhov as an unattractive drunk man. Radishchev is famous for his novel, “From Petersburg to Moscow” published in 1790. Historically significant for introducing radical themes into Russian literature, this novel detailing a journey earned the author a notable excursion into exile as a result. Radishchev’s work was controversial in its time as it offered a scathing critique of serfdom and refers to the Russian Empire as a “beast.” At each stop in the journey that the traveler takes between the two capitals the reader is introduced to a new social problem. Radishchev was a former page in Catherine the Great’s court and she took great offence to the work, demanding that it be destroyed. Only 17 copies survived. The author was sent into exile to the town of Ilimsk in Irkutsk Region, where he spent five years. Ilimsk no longer exists as it was flooded as part of massive dam projects on the Angara River in the 1970s. Strangely enough, the flooding of such towns as Ilimsk has been immortalized in the literature of Valentin Rasputin, a sedentary author who has never lived outside of Eastern Siberia. To pay your respects to Radishchev one must travel to Saratov, near where he grew up. The city’s art museum, one of the finest in provincial Russia, is named in his honor (Ul. Radishcheva 39).